Hello everyone. Kia here with you today for Team Tuesday with My Sweet Petunia aka MISTI. I have made a gift set for my friend who has a birthday close to Christmas. I always feel that December birthday celebrations get cheated ... but that is probably just me. 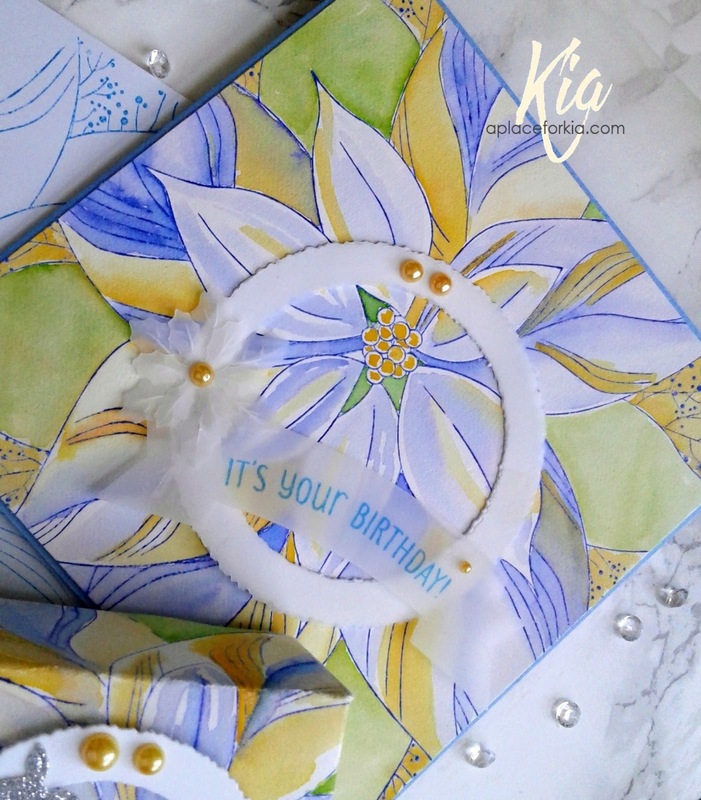 But, to make this special for my very special best friend I did a fancy card with a matching gift box and envelope. I have also done a video showing the process, and will add a few pictures from that for a picture tutorial, as some have said they prefer that to videos, and we like to keep everyone happy. 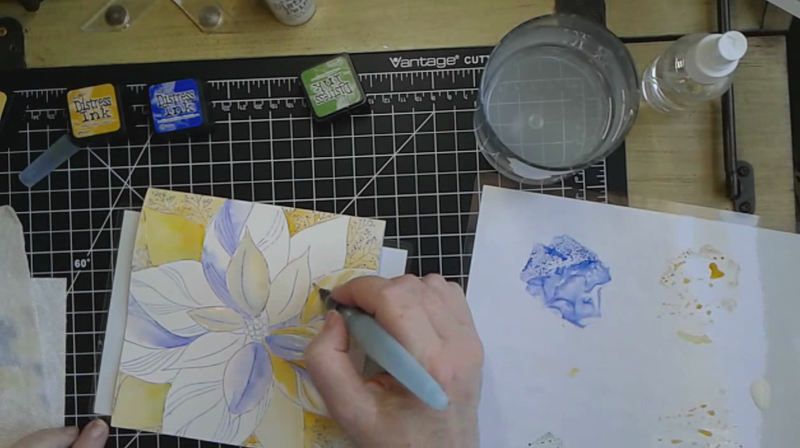 I started by stamping two of the Poinsettia images on Fabriano Hot Press 140lb watercolour paper using Tim Holtz Distress Blueprint Sketch Ink, that I heat embossed using clear embossing powder, and proceeded to watercolour using Fossilized Amber, Blueprint Sketch and Mowed Lawn. I painted two as I wanted to use one of the cards to make my box, but mid way through my project I decided I wanted my painting to be attached on blue card stock. So, I cut both cards down along the fold, keeping the painted image. I added the blue card stock to my card, and cut another piece of the blue card stock for my box bottom. To ensure the box fits snugly, cut it 1/8th" smaller than the cover on one side. This will be enough to allow it to fit. 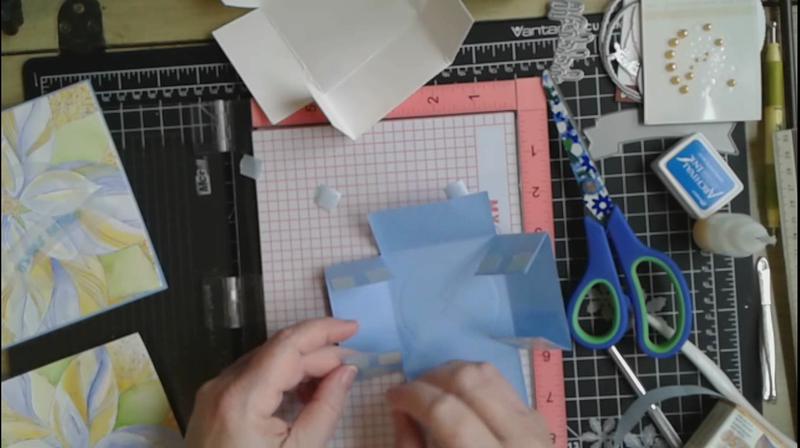 I use the grid lines and creative corners in my Misti to find the exact centre of the base for the box bottom. 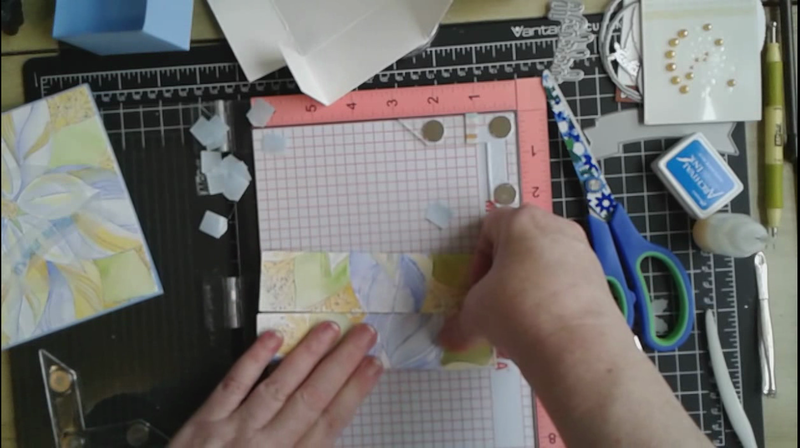 That is to say, using a ruler on on the diagonal mark the centre by drawing a line in the centre of the card, then turn the card and using your ruler, corner to corner on the diagonal, make your second line, which forms an X in the centre of the card. As this is a square card, it does not matter what sides you use to cut, (as long as the cuts are done on opposite sides), make your cut to the fold line as shown in the picture above. 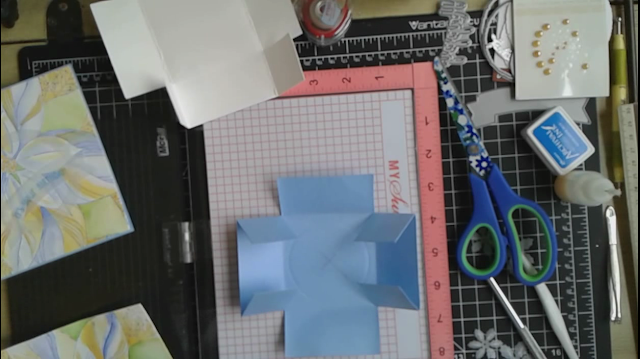 Use your bone folder to make crisp folds. Add your adhesive to the small flaps as shown above. It is these flaps that will be together with the bottom flap coming up and glued to keep them in place. Do the same for the opposite side. This will form the box. Do the same using the the top of the box piece. Shown here, I am folding the edges up to the centre. 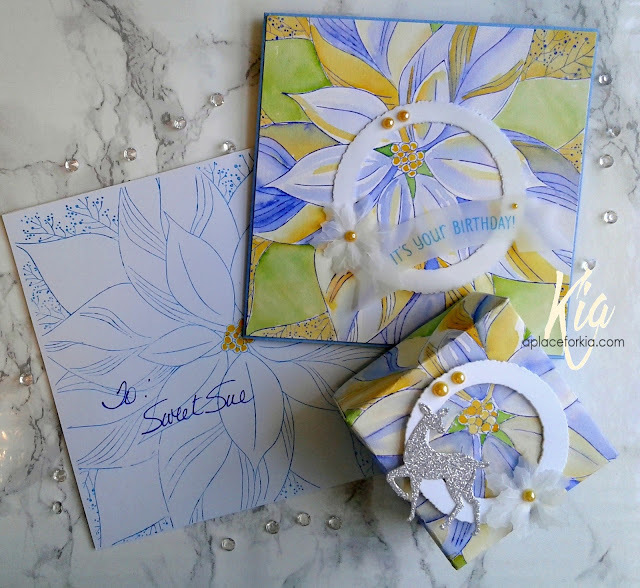 Proceed the same way, then decorate both your card, box and envelope for a pretty gift set. The video follows. I tried my best to keep it as short as I could. I hope you enjoy this project and thank you for joining us today. 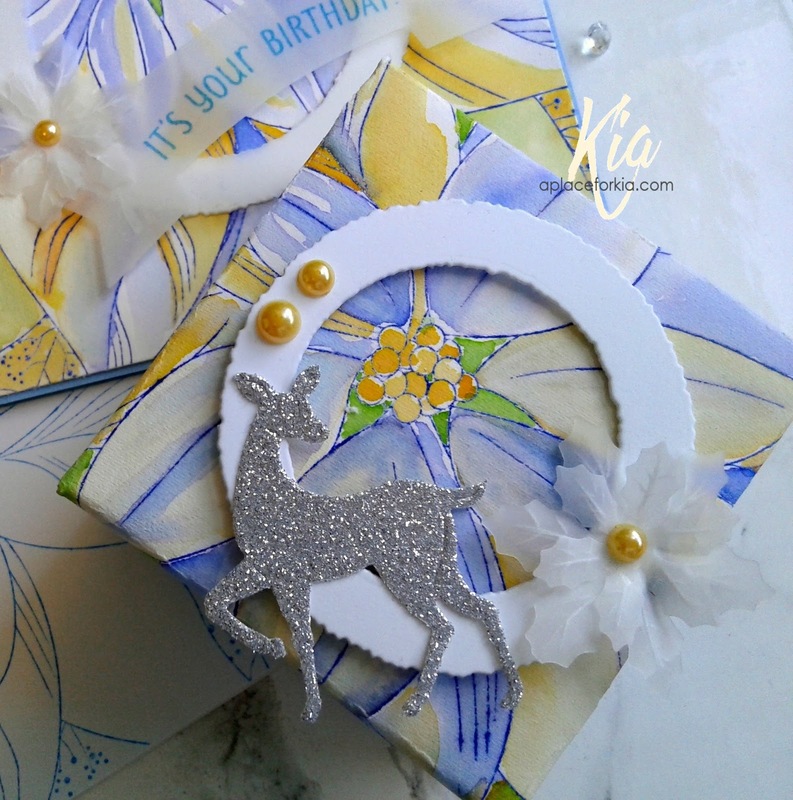 Products: MISTI Original, Frantic Stamper Deckled Circles Die Set, CottageCutz Deer Die Set, Cheery Lynn Poinsettia Die Strip, Fabriano Hot Press 140lb Watercolour Paper, Bazzill Card stock, Silver Glitter Card stock, Vellum Paper, Stylus, Ranger Archival Manganese Blue Ink (for sentiment), Tim Holtz Distress Inks Fossilized Amber, Blueprint Sketch and Mowed Lawn, Aqua Brush, Kaiser Pearls. How beautiful Kia and a great 'how to' tutorial. Thanks for that. I am sure your friend will love it. Thank you for sharing this card set. Kia I know just how you feel about those December birthdays! My first born? December 17th! and one granddaughter: December 27th!! Your special best friend is going to feel even more special on her big day when she receives this beauty! Team Tuesday with Ilina and Storewide SALE!